Kasplat Teaser Trailer and the Indie Dev Showcase! news - Kasplat! Post news Report RSS	Kasplat Teaser Trailer and the Indie Dev Showcase! The Kasplat Devlog is back! This week we get to present the first Kasplat teaser trailer as well as checkout how Kasplat fared at the Brisbane Indie Dev Showcase this week! The Geekabyte Games Devlog is back after a short hiatus, so a big welcome to all! Sorry for the short break once again, but we are back with some great new updates for Kasplat. As always, make sure to follow our Facebook, Twitter and Instagram to keep up with development and subscribe to our YouTubechannel for more video updates! 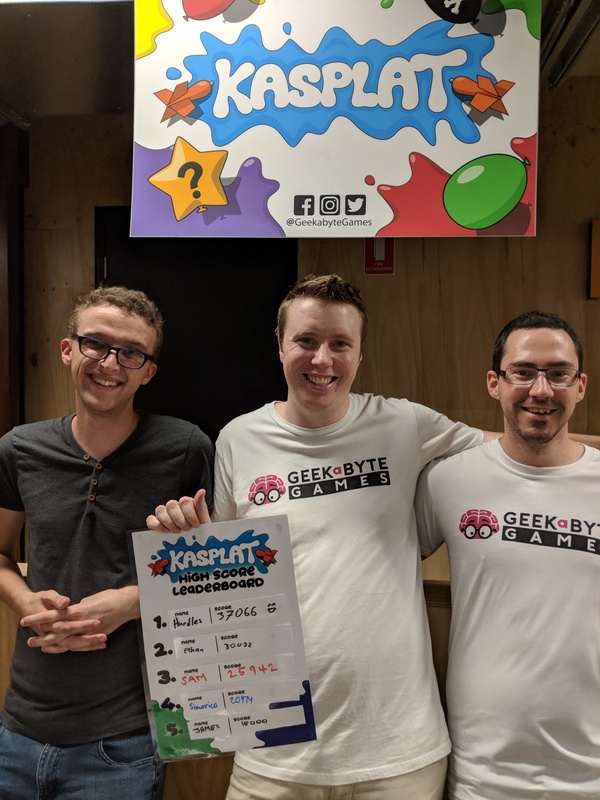 This week Geekabyte Games was lucky enough to be invited to show off Kasplat at a local Indie Dev Showcase in our very own Brisbane. Hosted at River City Labs, the night was a huge success with a wonderful turn out of willing testers. We were excited by the number of people who wanted to jump in and try Kasplat as well as the overwhelmingly positive feedback we received once again for the game. We were also able to present the very first Kasplat Teaser Trailer which was very cool to see featured on the big screen. Check out the trailer below. Once again there were some great comments from other developers. Suggestions for improvement to the responsiveness of the game, as well as the new powerup system which we can't wait to jump into implementing. The event also allowed us to debut the very first Kasplat High Score Leaderboard! Albeit in a somewhat more analog form. This little bit of fun was a huge success on the night with testers able to vie for the top 5 scoring places over the evening. Big congratulations to "Hurdles" who ended the night in number one place with a score of 37066, we as to all the other top 5 finishers! Finally we wanted to extend our thanks to River City Labs and Kaydos Walsh for organising the marvelous event and making it such a huge success. As well as a bit thanks to all who came along, both devs and not and to all those who played Kasplat and gave us valuable feedback!